Give each other your hearts and give to others with this custom-made anniversary platter. Give each other your hearts and give to others with Cassandra Ott and Grant Scott's custom-made wedding/anniversary platter. 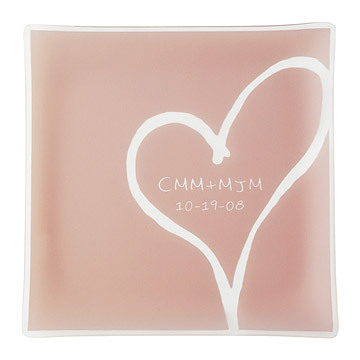 Handmade in Pennsylvania of recycled glass, artisans will laser engrave up to three initials of each person and the year of the wedding/anniversary. Each plate is hand cut from pre-consumer/ post-industrial recycled glass, then color is hand screened onto the glass. The plates are fired and sandblasted for texture. I gave this personalized plate for a bridal shower gift. I wanted to give her a unique gift that would be practical to use and a keepsake. This was perfect for that! The bride loved it and many wanted to know where I purchased it. The plate was even prettier than the picture. It just had the first initials of the couple along with the date of the wedding put on it to personalize and it looked beautiful. It shipped earlier than the expected ship date. It would make a beautiful wedding gift. Arrived as pretty as I was expecting it to. Purchased as an engagement gift for my sister. The quality and size were good. Not too delicate or fragile, but still has the art glass look. Love that it could be personalized. Would have preferred their names to monograms but this was the only option. Great product and very unique. I was asked to officiate at my neice's wedding and gave this gift to the bride and groom as a thank you for the honor. When I gave it to them it was clear that they were both emotionally moved by seeing their names and the date of their wedding on a beautiful plate. I was very happy with the quality and beauty of the plate. The etched frosted glass was very pretty, but the initial lettering was to small and out of scale with the plate. This is a beautiful and unique gift that I felt was perfect to commemorate my parents' 40th wedding anniversary. This was a wonderful gift for a friend that lives far away and I was unable to attend the ceremony. Sent it to her just before her first anniversary so they have a plate to eat their cake. She loved it, said it was great quality, and it was delivered quickly. Very happy with this gift!